At Jungle Gems we custom design and install Jungle Gyms to suit your specific requirements. Jungle Gems is an owner supervised business and quality workmanship is guaranteed. All timber is CCA treated Gum or CCA treated SA Pine, is sanded smooth to minimize splinters and all poles are cemented into the ground. Being a mother myself, we pay great attention to detail....especially safety. Please browse the site to get an idea of the individual components and view the photo gallery of some of the work we've done to help you create your ideal jungle gym. 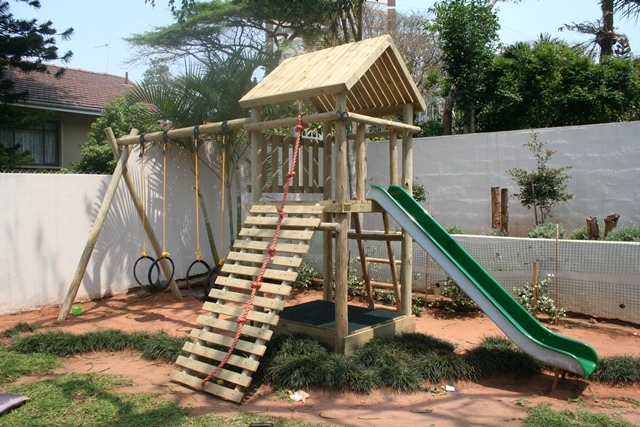 We also build treehouses, obstacle courses and supply various wendy house accessories. 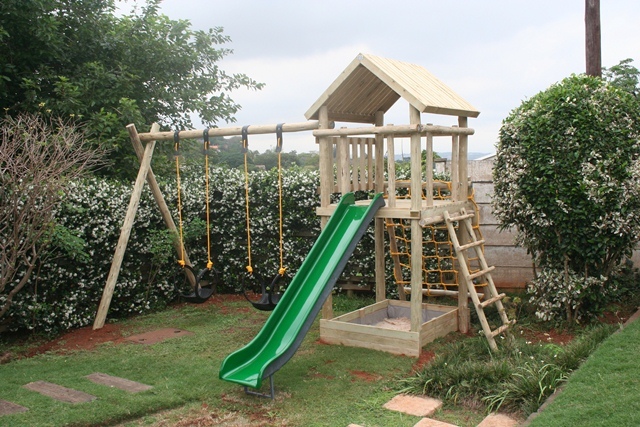 Provided that you are based in Durban or the Upper Highway area, we will gladly come out to you so we can measure up the space you have available, advise you on what components are age-appropriate and help you design something your child will enjoy. We only charge a R250 design and consultation fee which is refundable when you purchase our product. Please contact us for further pricing or for any other queries you may have. Why do children need a Jungle Gym? A Jungle Gym is vital to a child's educational, emotional, social and physical development. Jungle Gyms allows children to enhance their natural skills and creates a confident edge. A Jungle Gym also develops a strong self-image. The benefits to climbing are endless. Climbing works almost every major muscle group. They increase upper-body strength, using their arms and hands or they work their lower body using their legs. Climbing does more than work the obvious muscle groups. It also initiates good balance and body control. Climbing aides in problem solving and challenges the child to improve their memory, due to the need to remember certain grips and the location of hand and foot holds. It has been found that children more experienced with certain movements were better at recalling those movements later. Climbing also creates an awareness of space and direction by allowing the child to decide the best path to take to reach the intended destination. It improves power (strength to reach new heights), agility (moving from one point to another as quickly as possible), speed, balance (to stay on the path to the top), and coordination (Frost, 2005).